The Wondermat Standard Series is our flagship foam mat flooring product, introducted in 1992. 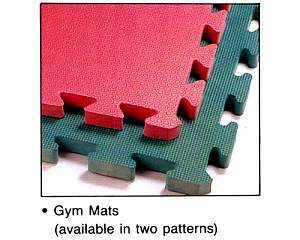 It is a full 1/2 Inch thick premium quality high denisty Interlocking Foam Mat System made with our exclusive EVA / PE plastic formula. The system features 3 tile sizew that all interconnect. There are 2 border systems to finish off the mat edges: Straight, 90 degree cut borders, or sloping, beveled borders. For home use, Wondermat® Standard Series is best know as an attractive, durable and safe interior design element in any children's play area; and is perfect for a variety of exercise areas, basements, and a host of other applications where soft flooring or cushioning is desired. Suitable for all indoor applications, and some outdoor installations.